We offer a wide range of Cylinder Sleeves. These product are made from superior quality stainless steel, that assures durability, high corrosion resistance, high rate of performance and years of hassle free working. 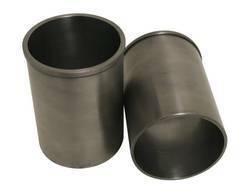 Cylinder Sleeves offered by us is suitable for Tata1210 vehicle and comes with standard bore of 90mm, outer diameter of 3.75, collar O.D. of 3.78, collar width of 5mm and in total length of 8.7/16. As well established manufacturers of Cylinder Sleeves, we ensure the solutions offered by us perfectly match up with the demands of automotive industry. Further, the support of latest technology and sound engineering principles also allow us to come up with customized solutions as demanded by the customers. Looking for Cylinder Sleeves ? Plot No. 415, G. I. D. C.